Typus Geographicus Chili Parguay Freti Magellanici &c.
SIZE: 22 3/8" X 19". Johann Christoph Homann, son; 1703-1730. Johann Matthias Hase;1684-c1742. Aka Hasius. Homann established his map publishing business in Nuremberg in 1702. 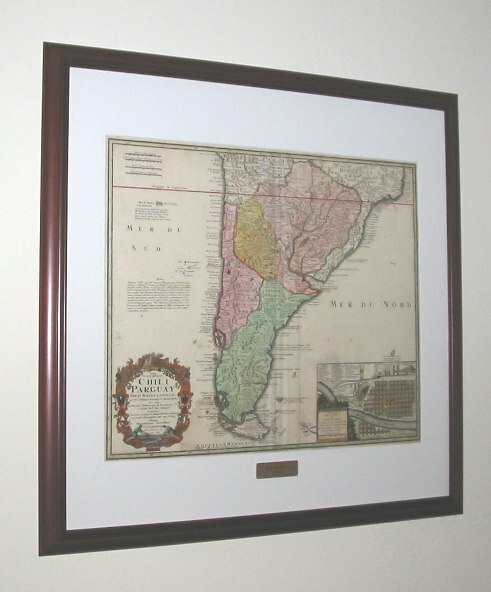 He printed loose maps, but specialized in the production of atlases. He developped a style of large and detailed maps, with complex and ornate cartouches. He often borrowed from known cartographers (such as Delisle, d'Anville and Chassereau), often giving proper credit to the sources. His first atlas earned him in 1707 a membership at the Berlin Academy of Sciences. He was soon nominated Geographer to the Emperor. His son took over the business in 1724, which he then bequeathed to his heirs, under the express condition of operating under the mane of Homann heirs. The firm continued to turn in atlases into the next century. Of note: the 1702 "Atlas novus terrarum" re-edited till 1753, Neuer Atlas, Grosser Atlas, and in 1747 the "Homannisher Atlas" re-issued till 1780, etc. Typus Geographicus Chili Par(a)guay Freti Magellanici &c.
ex PP. Alfonso d'Ovalle & Nicol. Techo ... a Guiliel. de l'Islio. This large map (22 3/8" X 19") is directly derived from a 1695 work by de l'Isle (see credits in the cartouche, to the explorers and the initial map maker). The present item was prepared in 1733. 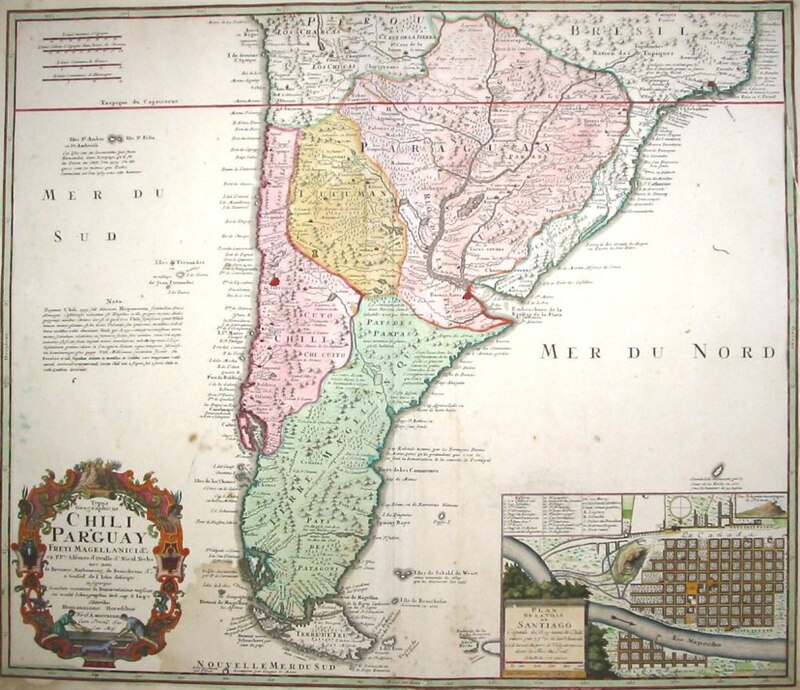 It had two inset versions: one with the Straight of Magellan, one with the city plan of Santiago. 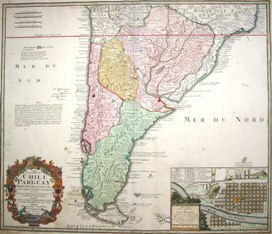 It shows the colonial administrative map of present days: south Brazil, Uruguay, Paraguay, Bolivia, South Peru, Chile and Argentina. - and a few main cities: Santiago, Buenos Aires and Rio (Rio is given its full name of: S Sebastien (São Sebastião do Rio de Janeiro). The ornate cartouche shows volcanoes, feathered indian heads, a seal, gold panning workers,. The inset depicts an amazingly large and well organized city: Santiago del Chile.